Merry Christmas to YOU - A Jewelry Giveaway! Aren't we all being so good shopping for all our friends and family? But what about YOU? Don't you deserve a little treat under the tree? I thought that maybe you deserved a little present yourself. 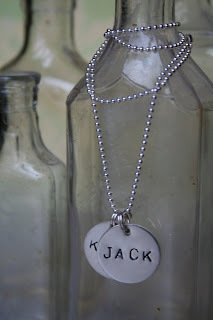 I am giving away a sterling silver hand stamped necklace with up to 2 charms. Not a mom? You can use any words you would like - Faith, Hope, Love, whatever! 1. Comment here telling me what words you would want stamped. 2. If you are a follower leave an extra comment (you can become a follower by clicking the follow me button on the right). 3. Blog or Tweet about my giveaway gives you TWO more entries! Hurry! You have until Wednesday to enter! Don't want to wait? *In the giveaway mood? My friend Erin is giving away set of her fun Christmas cards! I would want the words dream and big on them. Thanks for the entry! Love this! McKinney and Lynley would be my names! I'm not on twitter, but I'll FB you!! These necklaces are perfect. I don't have babies...YET, so if I win (fingers and toes crossed) I would want March on one and 15 on the other. That is my wedding anniversary. I'm heading over to Twitter and FB now! P.S. I tweeted and am of course a follower! I would want my 3 kids, Alex, Matthew and Ryan (and would pay for the 3rd one). I'm also a follower and I posted it on my blog. Tanya...what a wonderful giveaway...I came back at JUST the right time. Sorry, been preocupied with my dad's health recently. Two names would be of my 2 princesses...Ashley and Jordan. Love this! I would put my daughter's name, Audrey and Love on mine. Count me in! This necklace is lovely and I would want it to have a J on one and a G on the other for my initial and my husband's initial. 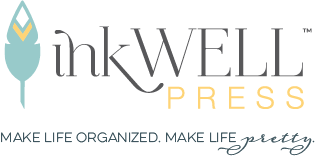 I have also added this to the sidebar of my blog under the giveaways section. I've been wanting one of these since I was pregnant with Charlotte; but I just haven't gotten around to ordering one yet. I'd have my kids names stamped Hudson and Charlotte. But I think they're too long; so I'd happily settle for a H and a C.
I am a follower and love the charms. Hmmm. Not sure what I would want stamped maybe amy and ann? Great give-a-way! Your work is beautiful! I am a follower and would have the names Ally and Brooke. What a great give-a-way! I would love to have this necklace stamped with Dallas and 4/13/09. One of my best friend's brother, Dallas, passed away last year in April from a brain tumor - he was 20 years old. I think this would be a wonderful present for my dear friend. 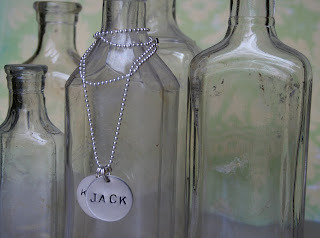 I would love to win this - I would have Alex, Andrew, and Caroline (of course I would buy the 3rd one) - I have wanted one of these types necklaces for years - LOVE THIS! I'm a (google reader) follower! THANKS! Love these!! I think i would put Faith, Hope and Love! AMAZING giveaway lady. I would want the two loves of my life stamped...Leland and Reed! I tweeted @gatorgrrl. Can you tell I like this necklace? Ah ha ha. Stop by our giveaway today if you get the chance! Thanks so much for all your sweet comments - the giveaway is now closed. The winner will be announced tomorrow!